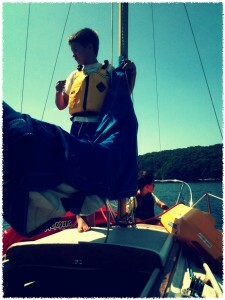 Yesterday morning we took a family day to go sailing. We motored south of the submarine base and put our sails up and sailed to Pine Island. We dropped anchor near the island and the boys kayaked to shore. 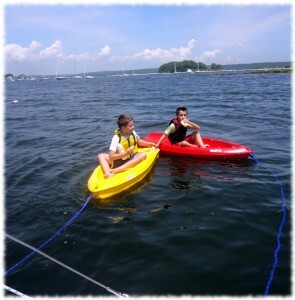 Eventually I swam to shore to walk around with the boys (and I needed a break from the sun). We didn’t feel comfortable going out of sight from the boat with it on anchor, so we didn’t get far in exploring the island. After we ate lunch I pulled up the anchor and we motored over to an old concrete quay wall, nosed in and tied a line around a broken piece of concrete. The wind was perfect to push the boat off the wall. Whenever we wanted to get on or off the boat, we would just pull the boat up to the wall. Of course, with only one line tied to a rock, I didn’t feel comfortable leaving the boat. Maybe next time we will find a second tie point and be able to picnic on the island. I think we all spent too much time in the sun on the water, and are all a little tired today, so this morning has been a quiet day lounging around in the air conditioning. The kayaks fit on top of the boat, but it made getting forward on the boat a bit of a climb. Cold water is a must. We brought ice, but didn’t use it as much as we should for drinks. Susanna shouldn’t read below decks – it is a good way to get seasick. I need to redo the rope ladder – it is way to short to make getting on the boat easy. Or better yet – install a permanent on on the stern. The wind really seems to die down once you get north of I-95 on the Thames River. 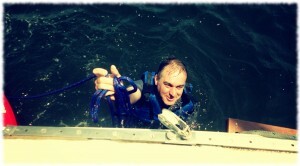 Enjoying a swim off the boat.